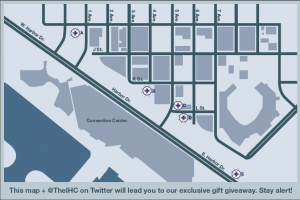 The Institute for Human Continuity is going to be having a presence at the 2009 Comic-Con in San Diego. They are looking for Ambassadors – for what purpose I have no idea, but it could be for something cool. I am happy to announce that, at Comic-Con in San Diego, the IHC will be looking for people to participate in our prestigious IHC Ambassador program. Our Ambassadors will receive access to exclusive resources and information from the IHC. I would particularly urge you to do your utmost to become an Ambassador. If you or someone you know is planning to go to Comic-Con, be on the lookout for the postcard we will distribute there. You’ll also want to follow @TheIHC on Twitter. This will be the main way in which we will communicate information about how one can become an Ambassador. We’ll also be seeking Ambassadors among those who can’t make it to San Diego, so it’s crucial to follow us on Twitter. Thank you in advance for your efforts. Remember together we can ensure the end is just the beginning. Update: @TheIHC posted this Twitpic that is supposed to help you find them as they give away stuff. They’ve also been awarding stuff to people who DM them first after they tweet, so keep your eye out for that if you aren’t at Comic-Con. Interested. what does that consist in ?